Over the past several months we have been celebrating our founder & CEO Jeanette Lynton's 30 years in the industry, so to continue this celebration and to honour National Stamping Month (September) CTMH has created this super cute stamp set of 30 little mini stamps! And when I say cute I mean CUTE! This morning I decided to get crafty with this stamp set and quickly came up with two 3x3 cards. I think the hardest part of the cards was deciding which stamps to use and I did stamp most of them in different colours to see which would work best. - Sunset Chevron Washi Tape! And yes, I did do the reverse pattern on purpose! - Pear Ink for my camera! A few Close To My Heart Consultants are having a month long blog hop/link up for all the many creations that are going to be made with this super cute stamp set and I am going to link these cards up. I hope you have a few minutes to check out some of the other artwork as it is amazing (as always!). Oh and one last thing... Would you like to get the super cute #30yearsofhappy stamp set for free??? FREE! you say, how do I get it for free? 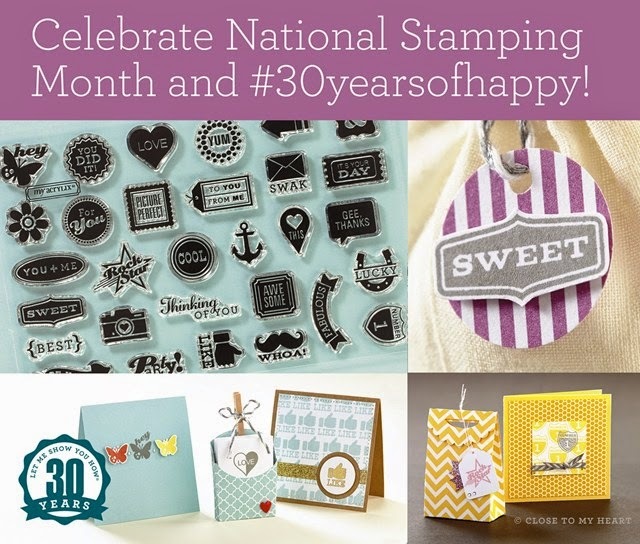 Well, when you spend $30 on any current retail-priced stamps during the month of September, you qualify to receive the exclusive C-sized stamp set #30yearsofhappy for FREE! Contact me today to get yours. I look forward to hearing from you and Happy Crafting.